The Health Insurance Portability and Accountability Act (HIPAA) requires healthcare providers (and other covered entities) to implement reasonable administrative, technical, and physical safeguards to protect the privacy of patients’ protected health information. HIPAA applies to electronic protected health information (ePHI) and physical records. Safeguards must be implemented to protect all forms of PHI at rest and in transit and when PHI is no longer required, covered entities must ensure it is disposed of securely. For electronic protected health information that means data must be permanently deleted so it cannot be reconstructed and recovered. To satisfy HIPAA requirements, the Department of Health and Human Services’ Office for Civil Rights (OCR) recommends clearing, purging or destroying electronic media used to store ePHI. Clearing involves the use of software to overwrite data, purging involves degaussing or exposing media to strong magnetic fields to destroy data. Destruction of electronic media could involve pulverization, melting, disintegration, shredding or incineration. For physical PHI, OCR recommends shredding, burning, pulping, or pulverization to render PHI unreadable and indecipherable and to ensure the data cannot be reconstructed. If PHI is not disposed of in accordance with HIPAA Rules, covered entities can face heavy financial penalties. Those penalties are decided by OCR, although state attorneys general can also fine covered entities since the introduction of the Health Information Technology for Clinical and Economic Health (HITECH) Act. While state attorneys general can take action against covered entities for HIPAA violations that impact state residents, few have exercised that right – Only Connecticut, Vermont, Massachusetts, New York and Indiana all done so since the passing of the HITECH Act. Even though few states are taking action against covered entities for HIPAA violations as allowed by the HITECH Act, many states have introduced laws to protect state residents in the event of a data breach. 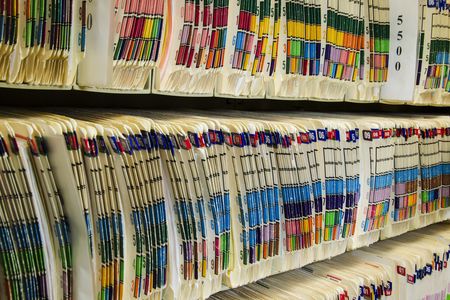 In Indiana, a new state law has been recently passed that allows action to be taken against organizations that fail to dispose of medical records securely. In Indiana, legislation has previously been introduced covering ‘abandoned records’. If medical records are abandoned, such as being dumped or disposed of without first rendering them unreadable, action can be taken against the organization concerned. While there are exceptions under SB 549 for organizations that maintain their own data security procedures under HIPAA and other federal legislation, the new law closes a loophole for organizations that are no longer HIPAA covered entities. In recent years, there have been numerous cases of healthcare organizations going out of business and subsequently abandoning patients’ files. SB 549 allows the state attorney general to take action against HIPAA covered entities that have gone out of business if they are discovered to have abandoned PHI or disposed of ePHI incorrectly. The new legislation came into effect on July 1, 2017. The new law allows the Indiana attorney general to file actions against the organization concerned and recover the cost of securing and disposing of the abandoned records. That should serve as a deterrent and will help to keep state residents’ PHI private.